Check one more item off the Heavenly Homemakers Recipe Challenge List! We have Butterscotch Chips! These are more than just a little bit sweet – wowza, these chips are quite sugary. Therefore, I must advise that you don’t eat the entire pan of butterscotch chips all in one sitting. I’m pretty sure you knew that already. I’m also pretty sure you are planning to eat plenty of vegetables before (and after) you make these. Right? Many of you wanted me to do this. I aim to please. Every single package of butterscotch chips I’ve seen on the market has hydrogenated oil in them. Bleh. It is very important to avoid hydrogenated oils. 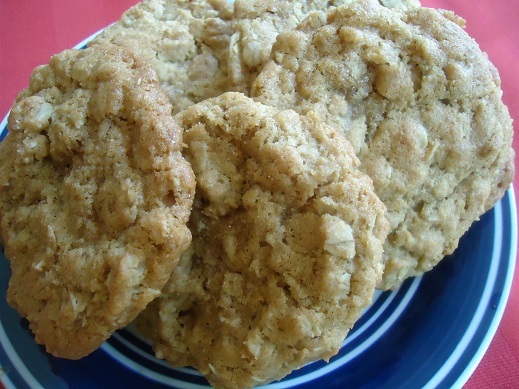 I need some Oatmeal Butterscotch Cookies. You will notice that I used organic brown sugar in this recipe instead of sucanat. I did this because I was afraid that the molasses flavor of the sucanat would effect the flavor of these chips, making them not taste like butterscotch. I had some organic brown sugar on hand, so I used it and was pleased with the results. In a saucepan, melt together butter, coconut oil and brown sugar. Stir continually until all ingredients are mixed well, bringing the mixture ALMOST to a boil, then turning down the heat. Cook and stir some more on low heat until the sugar is dissolved and the mixture is a liquid. Remove the mixture from the heat and stir in vanilla extract. Pour the contents onto a parchment paper lined container. I used a 9×13 inch dish. Place the dish into the fridge for 3-4 hours to allow the mixture to solidify. Cut or break the butterscotch into small “chips”. Store them in an air tight container in the fridge. Are you a fan of butterscotch chips? What’s your favorite way to use them? Read about making Homemade Chocolate Chips here! Wow! I am SO glad you posted this! I grew up eating butterscotch chips, but now I can’t bare to buy them. I can now have my cookies and eat them too! Woohoo! WOW! Laura, you continue to amaze me with your kitchen abilities! And it’s so simple to make!! THANK YOU THANK YOU! Never THOUGHT of making that myself. Awesome! Thank you! I was wondering about this so can I sub the same amount of organic white sugar (1cup) but how much mmolasses would I add to the reg sugar? Use them? I just EAT them. Hehe. Yet another thing added to my list of things to try! I LOVE butterscotch chips, but I refuse to buy them anymore from conventional places. And come to think of it, I don’t think that I have seen any at Whole Foods. I can’t wait for your recipe next week!! Thank you so much for sharing your recipe for homemade butterscotch chips, my daughter is VERY allergic to peanuts/tree nuts, so I need to be able to make my own chips. Please share your recipe for your cookies! I cannot wait to try these. But I will probably just eat them instead of putting them in anything. They look yummy. Thank you for sharing. Do you think butter would work in place of the coconut oil? Yes I think it would work, they just may be a little softer than if made with half coconut oil. Awesome recipes though, I will try again for sure! Can I use Sucanat instead?? Yes, you can, but like I said in the post, I just don’t think they’d taste as much like butterscotch if you use sucanat. You can definitely try it though! I’ve never liked butterscotch chips. They taste like sweet wax to me, must be the hydrogenated oils! Not a fan of butterscotch either, but BOY do I love chocolate! Do you have a Choc chip recipe? Dare I try this with rapadura? OH MY GOSH!!! I am not a big sweets person, however these sound heavenly (which is a good thing since you’re the Heavenly Homemaker). And those cookies sound delicious. I believe I may have to try this, as soon as I buy some coconut oil and my homemade vanilla extract is ready. Yummy!!! I’m drooling thinking about these. I am so excited to do this. Making the chips right now. But I need the recipe for the cookies!!!! Can’t wait!! Thank you for this recipe! I love butterscotch chips, but due to my oldest son’s milk allergy, I can’t buy them. I will definitely have to try this recipe. I’m sure he will love it! Wow, that sounds really good (and I’m not even a big fan of butterscotch)! Thanks so much for this!!! We can’t wait for the cookie recipe! I make a similar concoction using sucanat for flavoring my coffee. Mine is a bit more runny since I want it to dissolve into my milk, so I just use butter and sometimes a bit of maple syrup. I find the sucanat gives it a wonderful caramel flavor! It’s a great topper for popcorn as well. I’ll have to try with the coconut oil for making chips. I tried that for my coffee syrup, but forgot about how hard it would be when mixed into cold milk, lol! I don’t know what the difference is between butterscotch and caramel, but the sucanat makes a really delicious flavor! Thanks for Heavenly Homemakers! There’s a big old green book I think you might have a lot of fun with: Carla Emery’s Old Fashioned Recipe Book: An Encyclopedia of Country Living. I got mine over 30 years ago, and what a treasure it’s been – about EVERYTHING! Because you enjoy trying new things, and doing things natural, you might really like this book! It’s out of print, but still available on amazon, half.com, etc. Fun reading, even if you don’t try any recipes! Can you freeze them? i would love to make a couple batches and freeze so they are ready when I am ready for cookies. Also-can unsalted butter be used for butter in the recipe-or does that throw off the chemistry? I have not tried freezing these, but I don’t know why it wouldn’t work! And I think using unsalted butter would be just fine in this recipe. Virgin Coconut Oil tastes like coconuts. Expeller pressed is practically flavorless. As far as I understand it they are very similar when it comes to nutrition. You are now hero to my husband and daughter (you’ve been mine for awhile!). Can’t wait to try these! One question – does this recipe make enough for one batch of cookies? Most recipes calling for butterscotch chips call for anywhere from 1 – 2 cups. Just wondering if I should double. And like Ashleigh . . . they should be okay to freeze? This made about 4 cups of chips, which is a nice amount! Yes, I think they would be fine to freeze! Can’t wait for the cookie recipe!! It sounds wonderful!!!!! Oh my…they look fab! I am bookmarking this for sure!! Thank you, thank you, thank you for this recipe! I have been looking for organic butterscotch chips for a while now, with no success. Whole Foods doesn’t even carry them. I LOVE butterscotch chips, and oatmeal scotchies, but I haven’t had them in years because all of the store bought varieties have hydrogenated oils in them. Thanks again- can’t wait to try this recipe out! I only have cold pressed, VERY coconut-y tasting coconut oil. Should I try this recipe with butter or olive oil in place of the coconut oil? I’d go with all butter and see how it works! So excited to try this. I always have to special order chips due to food allergies and cross contamination. How nice to just be able to make my own. One I love your blog it’s fantastic!! Two could I make these without using parchment paper? Maybe butter the pan or use plastic wrap? I would not use plastic wrap as the hot syrup would most likely melt it :) That would not be good! I’m not a huge butterscotch fan… but between this post and the cookie recipe, I might just have to try these! Some how I must have gotten to much coconut oil as there is a white layer on top. Do you think this will affect then when baking? Naw, they should be fine! Oh.my.goodness! I made them with Sucanat. Oh.my!! They are so sweet and good! Had trouble with the butter/coconut oil and sucanat blending. The longer I stirred, the thicker it got. I poured into pyrex and froze. Haven’t tried in cookies yet. I’ll let you know. BTW, I always freeze (and keep frozen) HH’s chocolate chips. They work great! I made these today with my kids. I used the virgin coconut oil because that’s all I had and I really like the coconut flavor to them. Next time I’ll try the other coconut oil. Next onto your chocolate chips. Thanks for your blog. It’s my fav and I check it everyday. So, you’re figuring out white chocolate chips next, right? These look good! i made these with sucanat (the molasses granules not the honey granules) and they are awesome! tomorrow, i’ll be making the cookies. thanks so much for sharing. This may be a silly question but how do you measure the coconut oil? Do you just scoop it out and put it in a measuring cup or do you have to melt it first? I usually “eye ball” it as I scoop it out, then melt it, then measure it after it’s melted. As Becky asked, a white chocolate chip recipe would be awesome! I can rarely find those without partially hydrogenated oils. These butterscotch chips looks amazing and are going on our list to try. Just attempted my first batch & it was a complete flop. The sugar wouldn’t dissolve. Don’t know what I have done wrong:( I’ve been trying for 15mins now. How long did it take for the sugar to dissolve for you? Hmm, no mine dissolved in about 10 minutes time. Not sure what the trouble may be?? I stirred for half an hour, the sugar is still not dissolved and the mixture separates as soon as I take it off the heat. sugar down, fat above… Any idea how to fix this? Try whipping it thoroughly in a high power blender or with an immersion blender. Hope that helps! Can you use these home made chips in “butterscotch haystack” recipes? Thanks. I’ve never tried, so I’m not sure! Hi Laura! Have been so anxious to make these and finally tried this morning. But I had the same problem Nicola did. I tried for a half hour on low, and my brown sugar never completely dissolved. I just went ahead and poured it into my dish and we’ll see what happens, but all I had was a thick, granular “goo”. I’m assuming the sugar should have completely dissolved and the liquid be a semi-clear brown? I used salted butter, expeller pressed coconut oil (Spectrum was the only brand I could find), and the store brand organic light brown sugar (Kroger’s “Private Selection”). I’m wondering if it isn’t the brown sugar–it smelled almost like alcohol when I opened it up, not sweet like brown sugar should smell. I’ll see what this turns out like in a few hours, but have you heard of brown sugar that doesn’t melt?? Just wondering . . .
Well, the chips turned out okay, although when I tasted them they had somewhat of a grainy texture. I used them in the cookies anyway and they were fine. It still bothers me that my sugar wouldn’t melt . . . how can you trust a sugar that doesn’t melt? :) I’m definitely trying a different brand next time ‘cuz this recipe is a definite keeper! I’m wondering if it may have helped to heat it at a higher temp – get it to almost boil, but not quite because you don’t want it to turn to candy. Once it’s nice and hot, turn it down and stir a little more and see if that does the trick. I had the same problem-gritty chips because the brown sugar wouldn’t melt. I stirred for 1/2 an hour and it never got any better. The butter and/or coconut oil also separated a bit when I poured it into the pan. Next time you may want to try heating it to a higher temp – get it to almost boil, but not quite because you don’t want it to turn to candy. Once it’s nice and hot, turn it down and stir a little more and see if that does the trick. Ok – Problems. I used all the same ingredients, followed the directions, poured in the pan and put into the fridge overnight. They are still very very soft, almost like a taffy. I’m thinking I didn’t cook it hot enough. I tried very hard to cook at a low temp like the post says, but I think I needed to get the mixture hotter to harden up. Do you know how hot you cooked yours. I will try again, after I get more coconut oil. So I tried this recipe and the chocolate chip recipe tonight and I am so disappointed. I feel like I wasted so much money on ingredients in one sitting. I couldn’t get the sugar to dissolve at all and it just wouldn’t mix together. I even tried to stick the chocolate chip one in my blender and see if that would get it to mix together. I just put them in the fridge all separated and nasty looking and am hoping I can try to fix it in the morning. My cc one turned out a little “gritty” and the coconut totally set right on the top, but I think it will be divine in my cc muffins, and once I put them in something that “cooks” it won’t matter one bit! TY much for the dedication in finding healthy easy alternatives to tradition trashy favs! I need to buy some organic butterscotch chips…. in bulk. I’m not even sure I’ve ever seen organic butterscotch chips anywhere? Do you know of a brand you’ve seen before? Will these melt when mixed with peanut butter to make butterscotch confetti squares? I’m not sure, they are quite soft, so they might. I’m not sure what butterscotch confetti squares are, but they sure sound good! Very simple confection…you melt butterscotch chips and peanut butter together, add mini marshmallows when mixture is cool enough not to melt the marshmallows, press into a pan and let harden! A no-brainer, but really yummy for Christmas! I’m puzzled that neither your white choc. chip nor your butterscotch chip recipes include salt. Do you really not use any? No, I don’t use any, although I’m sure you can add a little without any problem. Well, I didn’t see this recipe until just now. 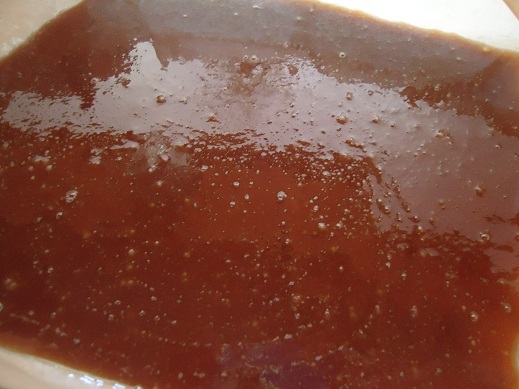 I followed a different butterscotch recipe (http://simplyrecipes.com/recipes/how_to_make_butterscotch/) and am now wondering if I can use this sauce in the way that you describe above: I.e., put it in fridge, let it harden, and then use as chips in cookies. I think the only difference in the recipe I used and yours is coconut oil (I used none) and heavy cream (I used). Any ideas whether this will work? I can’t say for sure, but I would think it should work. The butter and coconut oil never combined with the sugar and completely separated when I poured the mix into the tray. What happened? Does a lack of initial stirring cause this? So disappointed. I had a similar problem. I did get it to mix together but then when I put it on low, it separated. I thought maybe I had not cooked it long enough so I kept cooking. However, the longer I cooked it, the more it separated and the more the sugar seemed that it wasn’t going to dissolve and instead turn into candy. Any suggestions? How long do you think you usually cook it on low? You might try running it through a food processor to see if that helps mix it better. w heat undisturbed. Once sugar has melted you can stir. mess! Rats – I’ll have to try it again, but today’s recipe is ruined. Wondering if you can make this with sucanat…..have you tried? Mine did the same as Cami and Jennifer’s… Wonder what pitbullmama did differently!! Seemed like too much oil and eventually u felt like I was frying the sugar! Very disappointed!! I’m not very familiar with coconut oil but use olive oil for all my cooking and baking. Would that work as a substitution? I don’t think olive oil would work very well for this because the chips wouldn’t solidify enough. This looks yummy! Going to try to make these sometime; they have been my last real ‘junk food’ buy for a while now- I just love magic bars and brownies with butterscotch chips. I’ve been looking for butterscotch chips that do not have artificial ingredients or wheat/dairy/eggs. These fit the bill as long as I use our Earth Balance buttery sticks, so here’s hoping that will be successful. Thanks for posting this – I want to make Scotcheroos but haven’t been able to find butterscotch chips without the gunk in them. Did you make them with Earth Balance? I’d be interested to find out the results! 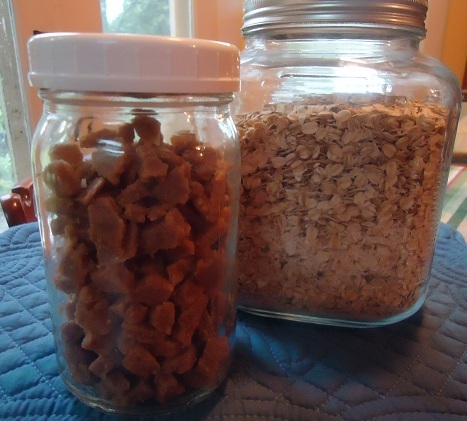 I just made these because my friend was recently diagnosed with diabetes and I needed a sugarfree butterscotch chip recipe to use in his favorite haystack cookie. I used Wheylow (an incredible sweetener) and crossed my fingers. They turned out beautifully!!! Sugarfree haystacks complete! Thanks!! So you used Wheylow instead of brown sugar?. Mine separated too! Did some research for second batch…found that if it separates again, add very hot water by the teaspoon to mixture. I used 3tsp and it came back together. Hope this helps. Mine separated too but I tried your tip and added 2 Tablespoons of hot water and it worked magically! Thanks very much, you just saved me having to dump that whole batch! Just a quick question. I want to make some cream cheese flavored chips for a recipe idea for the fallowing cookies ( http://www.justapinch.com/recipes/dessert/cookies/cream-cheese-cake-mix-cookies-8.html ) but have no clue where to start. ? Any ideas, please help? Oh wow, I’ve never heard of cream cheese flavored chips. Sounds yummy! Off the top of my head, I don’t have any ideas for making them. WELP, i tried numerous times and failed all. i find it odd that coconut oil is used. brown sugar has a melting point of roughly 360 to 370 and the oil clearly says use for temps below 325.
butter and oil didn’t mix once sugar was brought in. Many have had that problem with this recipe. It seems that adding a step of mixing this well with a hand mixer helps really get the ingredients to stay together better. I just have one quick question: would this recipe work for haystack candy? Try heating a cup of water and the brown sugar first, and simmer until the sugar has dissolved completely. Then add the butter and coconut oil. Simmer on med-low while stirring for about 10-15 minutes so most of the water can evaporate. Came out perfectly! Curiosity question here: those of you who ended up with a grainy oily mess – did you use a nonstick pan? I had a similar experience several years ago when trying to make a caramel sauce by melting sugar. I stirred and stirred and STIRRED the (white) sugar in my nonstick pan and never could get it to melt – finally realized it was re-crystallizing as soon as it melted. Transfered to a regular stainless steel pan and it worked within minutes. So now I’m wondering if that might be the problem? Anybody else have any ideas? Also, Cherina, I think the melting point of brown sugar wouldn’t factor in very much here – you aren’t necessarily melting the sugar as much as dissolving it. Sugar solutions can become liquid at much lower temperatures than sugar alone. Most candy recipes are cooked finished when they reach 250-300 – hard crack (like lollipops) is 300 and I would think these would be considered in the hard ball/soft crack stage (260-280). Hope that helps! Worked beautifully for me. I used my palm shortening and had no issues. I allowed the shortening and butter to melt then began the stirring with a whisk. All came together to a boil, then I lowed the heat and continued until it was a lovely milk carmel color. Can you use a natural sugar free sweetener instead of the brown sugar, to make them sugar free?. You could try what is called COCONUT SUGAR. Its not really sugar its the nectar of the coconut flower extracted than dehydrated in to granuals. Its very high in nutrition because its a whole food as opposed to sugar being processed taking everything out but the sweet. It doesn’t dissolve well though. BROWN RICE SYRUP and BARLEY EXTRACT SYRUP are also natural sweeteners, but are fairly syrupy and I don’t know how they heat up. If you are ok ending up with a caramel sauce to use for drizzling in case they don’t set you should try it. Just don’t have your heart set on chips, expect to experiment ending up with something sweet and yummy to be creative with. You can’t really go wrong with butter, coconut oil, and a sweetener. Hi. Do you think just standard cooking oil would work? I think so but haven’t tried it. Mine turned out great. I cooked on a lower- medium heat continuously whisking. I then made Peanut Butter Marshmellow Square/Butterscotch Confetti Square, by removing the butterscotch from the heat adding the peanut butter to melt in. Let cool then add your coconut and marshmallow. Thank you for providing a non hydrogenated alternative. What should the end consistency be like when it is removed from the refrigerator? Mine was pretty pliable, like caramels. I think I did everything correct because the oils didn’t separate. They look and taste great but for whatever reason I thought the mixture would have been harder to cut. Hmm, I’m wondering if the mixture got cooked too long? the oil did not mix and there is a white layer ontop of the brown. can I still use it for something? I don’t want to throw it away. was planning for haystacks or magic cookie bars,would it still work? Yes, it should still work if you mix it with other ingredients! Bummer bcz this recipe did not turn out well at all. I make toffee all the time but this was a huge flop:( it separated and probably burned. It was so awful looking I did not bother to put in a cooling pan. Looked like curdled mush in a pool of oil. I wasted all the ingredients and now I need to go buy the toxic chips. Can you be more specific about the size of your dish? A 2 quart container might be large and shallow or small and deep. I’m trying to figure out the surface area. I’ve been making an almost identical mixture as part of a recipe for chocolate toffee. I cover a 13×9 pan with parchment and pour it over crackers before adding the chocolate. It is still rather thin, though. That would be 117 square inches. An 8×8 pan would be 64 square inches. Should I look for something in between? My oval 2 qt. corning looks like it’s probably the same area as the square 8×8… does that sound similar to yours? Also, regarding the separation… with the chocolate/toffee recipe I make, there are 2 sticks butter (1 cup) and 3/4 cup packed brown sugar (like I said, it’s similar). It is completely separated for most of the cooking time. I have to stir continuously for about 6-7 minutes and then it finally blends and gets a little frothy. After cooling, it ends up being a harder, candy-like consistency. I don’t want the butterscotch chips to turn out like the toffee. 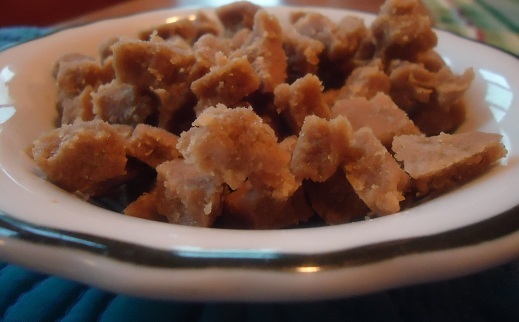 I really want a softer, melt-in-your mouth texture for the butterscotch morsels… like what your picture looks like. Do you think it’s the coconut oil that keeps it soft? Is it the cooking time or the thickness (size of the pan)? Any ideas? I am so looking forward to making Scotcharoos without transfats! Have you ever tried to make Vanilla Baking Chips, not white chocolate chips? They can be very difficult to find, so it would be great to make my own. No, I’m not sure how I’d go about making those. I’ll give it more thought though! Thank you for posting this. I am wondering (before I try), can you do this recipe without letting it harden into chips and just use the softened stuff to mix with chocolate chips? The recipe I wanted to use is for making ‘special k’ type bars, or the peanut butter, cereal bars that have the chocolate chips and butterscotch chips melted as the topping. I hate using the store-bought garbage with all the hydrogenated oils. But in this recipe you melt the butterscotch chips with the choc. chips, so I wouldn’t need to let them harden. Do you think that would work for this? Yes, I would imagine that would work fine! I too had the goopy oily mess when making these, but was able to save it! I added about 1/4C of water to the mix and it immediately all dissolved. From there, I just boiled it down a bit until it looked to be a good consistency. Does it turns to be gooey ? I had mine separated and gave up and kept it in the fridge. ???? Another person chiming in about separation here! Billy and Amy have it right. Mine separated and looked really ugly, so I sloshed in a tiny amount of very hot water from my kettle and it immediately settled and looked perfect. It was about one and a half teaspoons, so it won’t wreck the consistency at all. It’s cooling in the fridge now. Can’t wait for the cookies I’ll make!! the recipe sounds great, but I would also love to try out the Butterscotch Oatmeal Cookies. I couldn’t find the recipe, though. Could you indicate me the link? I just found this site! How would this recipe compare as far as amount–how many bags of chips would be the equivalent? Thanks! I would say this recipe makes a little more than a 12-ounce package of chips…just a guess! hi! im making the bs chip as per your instructions, but the oil and sugar wont mix. so i added 4 tsp of hot water and it mixed well, thankfully. and my problem now is, it wont hardened. i put in fridge for 3 hours already, yet when i take it out wanting to break into smaller pieces, it quickly becomes softened and starts melting again. pls help!! another question, did yours melt into the batter when mixed/baked? or will u still be able to see the chips when u eat the cookie? Unfortunately this didn’t work for me at all. I mixed until the sugar melted but couldn’t get the oil to mix. The second time I added hot water, as others suggested, the mix blew up like a bomb 6 feet up to my ceiling and all over everywhere. Can you melt these and use it as a coating for other candy? I was curious if it would set up (think of a coating like the chocolate on a Reese’s Cup). Thanks! I used 1 cup of water and added the brown sugar, brought to a low boil and then reduced to low simmer until the brown sugar was completely dissolved (Note, I also added 1/4 tsp. of salt ). I then made a roux with the butter and coconut oil and a Tbs. of Bob’s Red Mill 1:1 and browned lightly in a separate pan. I scraped the roux into the mix and stirred over low heat to melt/incorporate. HEAVEN! Thanks for the inspiration! I tried this recipe until I was out of brown sugar and butter. …I have no idea what I am doing wrong. I followed the instructions, although I found “stir some more” to be rather vague. Every time I ended with burnt, unmixed ingredients. I combined the butter, oil, and brown sugar. It almost boiled (was frothy, which I’m not sure if that’s right), and I turned it down to low, while never stopping stirring. The ingredients never combined, and every time I added vanilla, it seemed to burn more. Please help me! I really want to make homemade butterscotch for a recipe, because I couldn’t find any organic chips, but I can’t bear the frustration of doing what I’ve already done again …is there anything specific I’m missing? Is it supposed to froth? Did your ingredients fully combine or was there an oily residue on top? I assumed there wasn’t to be any oil separated, so I kept mixing. Even after it was burnt, I still had about a half cup of oil that never mixed… help! Thanks! Mine seemed to melt too fast into the cookie batter and not retaining it’s structure. Is there a fix for this? Tasted fantastic though, the oatmeal scotchies got rave reviews. I’m midway through trying this. I used the method suggested in the comments of dissolving the sugar in water first (I used boiling water to give it a head start), then adding the butter and coconut oil and simmering until the water evaporated off. Unfortunately when I set it, I ended up with a layer of coconut oil on top, with still liquid butterscotch underneath. I’ve reheated it all, and I plan to beat it with a hand mixer as it cools to try to blend the fats together. Fingers crossed! Hi I dont have butter on hand. Any chance it might work using coconut oil plus white deodorized cocoa butter in lieu of the butter? Or will the chips be missing the butter flavor? Sorry if this is a stupid question. Any help would be appreciated thank you!! Hi i want to try ur recipe as i hv a cake order that requires butterscotch chips. Can i replace coconut oil with vegetable/ sunflower oil? Also i need these for baking. Would they hold shape or melt ? I don’t feel they will hold their shape well, unfortunately. I got some butterscotch essence, can I use that instead of the vanilla? And is the coconut oil absolutely necessary? Butterscotch essence should work, and you can skip the coconut oil but the chips will be softer. I’m sorry Laura but I agree. I did realize this was candy and my daughter tried it, I told her from the beginning it might not work. They did mix well, but they didn’t set. And everyone who is asking, NO you can’t use another oil. Coconut oil is one of the things that makes them set when you refrigerate. On the other hand its also what makes them completely not hold their shape when you cook them (its melting point is 70degF), so I have no idea how you baked cookies with them. Just don’t have the expectation of chips and plan on a yummy butterscotch goo that you wrap in wax paper into individual candies and keep in the fridge, or drop in a drink. Then if they happen to turn out you will be pleasantly surprised. Any ideas of what to change if they don’t set? Partial Solution to Gritty: I experienced the same result with the grittiness. I tried a second time with all butter and started slow and slow. I used cold butter (full sticks uncooked) and waited until the butter was melted to begin increasing the heat. I continued to increase the heat in small increments until I started to see one of two bubbles, then I turned the heat all the way down again and continued to stir a few minutes more until the taste was butterscotch and the liquid seemed a little more fluffy. It was a bit granular but no where near what it was in the first batch. I think I started at medium heat and the sugar got too hot while waiting for the butter to melt. Hi, I tried your butterscotch chips recipe. Thank you. I let it almost boil and simmer for few mins. But the butter just separated from the mixture. But the taste is awesome though. I used butter instead of coconut oil. Can these be melted to use for a topping? This was an epic failure. Used a candy thermometer and stirred as directed and the end results was a grainy mess hardened in butter?